The ever-changing, yet frustratingly slow nature of comprehensive cannabis laws have made the pursuit of finding careers difficult for many potential candidates. States that have passed recreational weed are already forming microcosms, indicating that the cannabusiness has the potential to create numerous jobs and bring in significant revenue to local and state commerce. In this rollercoaster ride of an industry, it’s best to keep an eye on developments, so you don’t get left in the dust and can achieve those elusive six figure marijuana jobs. 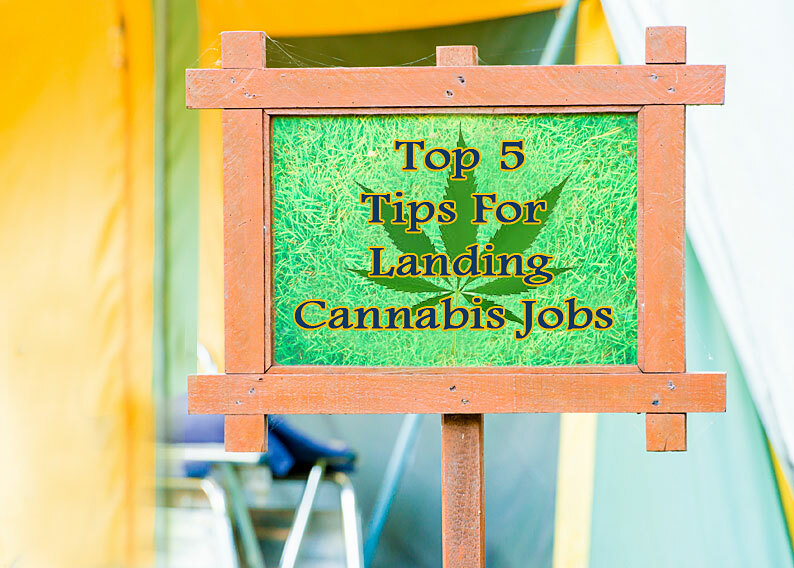 Below, we have broken down our top 5 tips for landing cannabis jobs. Despite some cultural associations indicating otherwise, the cannabusiness is a professional industry. Our first set of tips for landing cannabis jobs is on becoming a cannabis professional. If anything, this new, highly regulated industry requires more from businesses and their employees in terms of regulatory compliance. For this reason, it’s important first and foremost to establish a working relationship with weed. Don’t worry, no one is making you give up cannabis for enjoyment, but the business end of things task employees with the responsibility of following guidelines to a “T” when at work. A strong effort has been put forth in recent years to “re-brand” cannabis as a more socially acceptable word and imagine. In fact, the word “cannabis” itself is a direct result of rebranding as more industry professionals ditch “marijuana” and the stigmatized history it unfortunately has ties with. Being professional is essential to weed world success. This industry is unique in that relegated to specific states in which each one’s operations have direct influence over potential federal legalization. Essentially, other states are watching regions in the west coast and Colorado especially to see how their job market and tourism is buoyed or not by medical and cannabis distribution. A great example of how the cannabusiness is run like any other industry can be observed by entering a cannabis dispensary and purchasing products. Dispensaries can appear just about in any physical location, much like other retail businesses. Driving across Colorado, you’ll see dispensaries tucked away inside strip malls and others in spacious, decorated storefronts. Although the general atmosphere of these legal pot shops is relaxed, you will quickly observe how regimented the process of buying pot can be. Upon entering a dispensary, it is likely you will have to immediately show your valid identification, signaling your status as an adult and/or medical patient. Usually there is a receptionist or security guard there to check the ID and enter your information into online databases. Dispensaries experience a lot of oversight, so record keeping and security footage is essential in case an issue comes into question. Once you’ve been checked in, you’ll either wait in the lobby or go on in to see your budtender. Budtender jobs are some of the most highly pursued in the business, inhabited by the most stoked pot professionals in the biz. In terms of purchasing products, everything is kept in an enclosed display until chosen by the budtender. From here, the product is weighed, packaged and put through point of sale. All in all, the experience is casual but strict simultaneously. Our second round of tips for landing cannabis jobs involves pot proficiency. There are a lot of individuals who like to consume cannabis, however, that does not necessarily make them the right fit for the cannabusiness. Working in this industry is a dedication not only to enjoying cannabis but to learning everything you can about it as well. Whether you want to work master grower jobs or those in dispensaries, you’ll need to have an in-depth understanding of the different levels of cannabis production. This includes knowing about the phenotypes of cannabis strains, the basics of cultivation and processing. The weed market contains many more products than just flower, all of which need to be learned in order to participate in this industry. Cannabis concentrates and edibles are especially important as they have major stock in the medical cannabis community. Concentrates are cannabis extracts – highly potent, mostly pure substances rich in cannabinoids THC and CBD, as well as terpenes. Consuming concentrates results in stronger effects and more sustained highs, without the additions of excess plant matter. Cannabis concentrates are made by individuals working cannabis extraction jobs. This position represents one of the more highly paid, responsibility-driven cannabis jobs. Edibles, which have been around since the dawn of cannabis cultivation have received the Hollywood treatment, getting glam makeovers into trend setting treats ranging from iced chai lattes to classic cookies. Unlike traditional preparations of edibles, most weed-infused food and beverage products do not use cannabutter. This is because cannabutter is harder to standardize and contains more excess fats and chlorophyll. Now, concentrates are infused into food, giving products a less pot-heavy taste, without sacrificing cannabinoid content. The other area of cannabis knowledge all applicants should familiarize with is cannabis law – especially when it concerns your home city and state. Cannabis regulations are admittedly confusing, however, they must be followed strictly. The best way to obtain legitimate information on cannabis legislation is to visit your state’s “.gov” website. To decode this convoluted legislature into lay terms, visit norml.org/(your state) to get an in-depth analysis of these items. Regardless of exactly what position you are hoping to obtain in the legal cannabusiness, customer service is always a good skill to maintain – that’s why this round of tips for landing cannabis jobs is about brushing up your customer service skills. Unless you have previous experience working in the weed industry or you have advanced degrees and certifications, you may find the best place to start your career is with entry level cannabis industry jobs. Unlike some other industries, the beginner level jobs in the cannabusiness are actually highly desired positions like budtending and dispensary reception. Both of these titles require employees to not only be sharp of cannabis terminology and law, but to be friendly and attentive to customers as well. Budtender and dispensary receptionist jobs are the face of the industry and as such have a tough precedent to uphold. This is why some dispensary hiring managers choose to only hire individuals with past experience working in the service industry, even if it had nothing to do with weed. The fact of the matter is, being a budtender isn’t that much like being a bartender in practice, except for the medical efficacy cannabis products holds over alcohol. So in addition to offering good advice to customers, employees have to be affable and influential enough to keep customers coming back. Especially as some cities start to become nearly oversaturated with dispensaries per capita, good budtenders influence the consumer’s decision to go to your dispensary, or the one a few blocks down. When asked how to apply for marijuana jobs, one trend that remains true over time is the importance of making professional connections. As we detail with the following tips for landing cannabis jobs, never is this more applicable than in the cannabis industry where nepotism has historically run rampant. Under the legal biz, there are more opportunities than ever before, but employers still often hire individuals that they know. Credibility is an issue in this business. The threat of internal theft is high and the regulations, many. For this reason, employers may go the route of choosing someone they already know and trust enough to work in their business. Making connections doesn’t necessarily mean you have to become best buds with your budtender. Rather, it means you should assert yourself as a presence in the cannabusiness and get your name and face out there. This can be as hands-off as chatting with local dispensary employees about the cannabusiness, or attending meetups and functions related to weed. Regardless of your methods, getting to know people in the business will only help your chances of landing a job. What does it mean to be educated in the cannabusiness? Well, there are a few possible answers to this very valid query. Our fourth set of tips for landing cannabis jobs gives you the basics of what kind of training employers care about. On the one hand, having a degree from a four year college or university can be beneficial, especially concerning jobs like growing, where a vast knowledge of horticulture is a legitimate asset to your resume. The cannabusiness offers some of the greatest jobs for cannabis lovers with college degrees. Conversely, if you want to be a budtender, having a degree won’t necessarily matter that much, especially where employers value experience over academics. With this in mind, pursuing an education in cannabis is possible on a budget. One way more people are gaining valuable experience is through online and in-person marijuana job training programs or “universities.” These organizations (when reputable) assemble teams of industry leaders to compile courses on the basics and advanced principles of everything from cultivation to making edibles. Be wary, however – cannabis college is not accredited under the same standards as traditional modes of education – at least not yet. When searching for worthy programs, conduct research to see how each certificate program actually helps trainees in the “real world.” If a program has proven success increasing job placement of applicants, then this is quite possible a worthy resource to investigate and pursue. In general, these training programs are all fairly new, so it’s best to ask employers whether or not they consider certificate programs to be valid as a form of experience. With everything in mind, our final tips for landing cannabis jobs involves you being the master of your own destiny! Take an active role in your job search and integrate yourself into the cannabis world (as much as feels comfortable in your location). A great way to easily keep up on new cannabis laws and everything weed-job related is to subscribe to free, online cannabis magazines. Check out High Times to get a daily dose of news and explore as many options as you can to become educated and gain that all-important cannabusiness credibility.